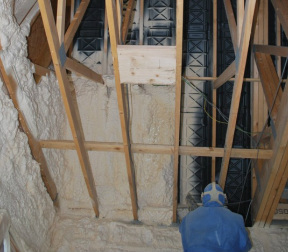 As we read in our page on Open Cell foam , the type of foam that you end up with is determined or driven by literally the amount of expansion that takes place when the foam is 'sprayed' . If the foam expands a lot you get an open or fractured cell structure. If the foam expands a little or less then you get a largely closed cell structure i.e. the cell walls largely remain intact . None of this is accidental. Each foam manufacturer engineers their formula to create either an open cell structure or a closed cell structure . So with closed cell foam , the foam doesnt expand as much when sprayed and as a result the cell structures trap the expansion gases within their cell walls forever (well, a little is lost over time but not so you'd notice) . If open cell is a great foam why bother use closed cell? Great question and it comes back to the "horses for courses" story. It's not that that open cell is better than closed cell or vice versa. It's that each one does things differently. Have a look at the comparison below and you'll quickly see why each type of foam has its 'sweet spot' when it comes to differing projects. Can be sprayed underfloor or under screed .